SQM is pleased to announce our 2013 award winning call centers and frontline employees. This is SQM's 15th Annual Most Prestigious North American Call Center Industry 2013 Awards for Service Quality Excellence. SQM is pleased to announce the call center and frontline employee Service Quality Award of Excellence Winners for 2013. These prestigious call center industry awards will be presented at SQM’s annual conference held in Washington, D.C., April 15th & 16th, 2014. SQM benchmarks over 450 leading North American call centers on an annual basis and has been conducting first call resolution (FCR), employee satisfaction (Esat) and customer satisfaction (Csat) benchmarking studies since 1996 (click here for benchmarking details). On an annual basis, SQM conducts over 1 million surveys with customers who have called a call center. SQM also conducts over 25,000 surveys annually with employees who work in call centers. Based on our call center benchmarking studies, SQM awards excellence in FCR, customer and employee satisfaction for the call center industry. SQM awards are unique in the industry as they are based on customers who have used a call center and/or employees who work in a call center. For each call center that participated in our customer benchmarking study, SQM completed 400 post-call phone surveys, conducted by SQM’s telephone survey representatives. SQM awards are based on customers who have used a call center and/or employees who work in a call center. SQM conducted the benchmarking studies for the period of January 1, 2013 to December 31, 2013. SQM has 40 different awards that recognize the top performing call centers. Based on the call centers we benchmarked, SQM is honored to recognize the following Call Center Industry 2013 Award Winners of VoC Excellence. Click here to see a complete listing of ALL the award winners! Criteria used for Call Center of the Year are based on having the highest combined customer FCR and employee overall very satisfied (top box response) rating. 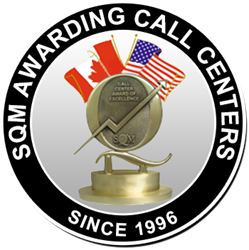 The Call Center of the Year winner will be announced at SQM’s Call Center Industry 2013 Conference on April16th in Washington, D.C. Criteria used for Best Performing Small- to Mid-Sized Call Center (under 100 CSRs) are based on having the highest combined customer FCR and employee overall very satisfied (top box response) rating. The Best Performing Small- to Mid-Sized Call Center winner will be announced at SQM’s Call Center Industry 2013 Conference on April16th in Washington, D.C. Criteria used for Call Center World Class Certification are 80% or higher of the calls are at the world class level for 3 months or more. SQM’s world class call criteria are based on the customer’s call being resolved, the customer is overall very satisfied (top box response) rating with their call center experience and the customer service representative. Criteria used for Highest Customer Service by Industry Awards is based on having the highest FCR for an organization in each specific industry/sector. In closing, SQM would like to congratulate all of the award winning organizations and their CSRs and Supervisors. Their world class performance is vital to their organization’s success!